All together at the Thai Secret Cooking School in Chiang Mai! 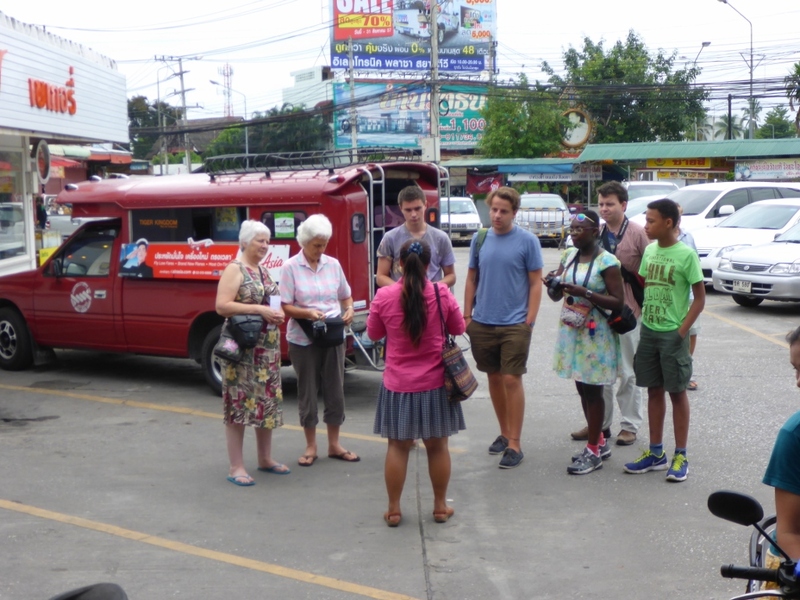 Last week, I told you about our introduction to the outstanding and most lovely Chiang Mai. What a beautiful town. I also told you how Thai food was so delicious that surely, it would kill you! 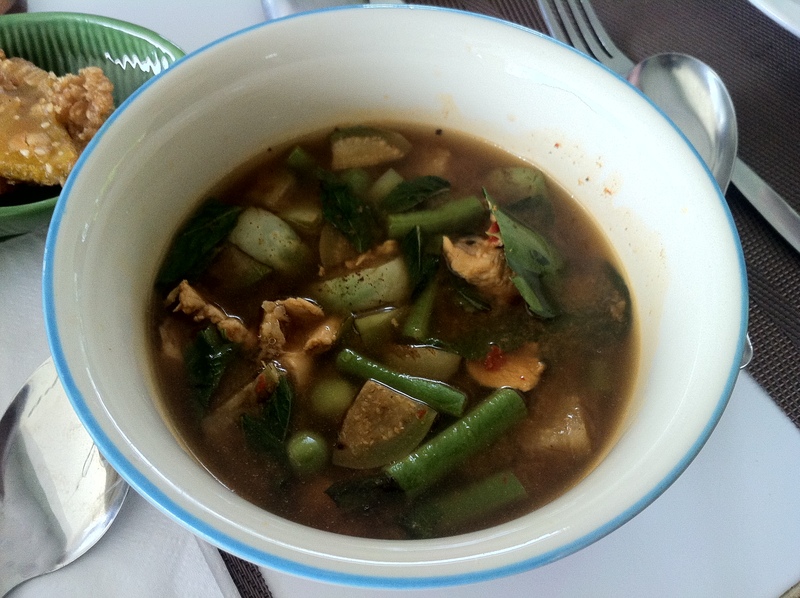 In Part 1 , I introduced you to all the yummy features of Thai food. The simple fact is that we loved Thai food so much that we decided to learn how to cook it! In that wise, we decided to do some research on cookery schools in Chiang Mai and decided to go with a splendid cooking school called Thai Secret Cooking School. I’m not the best of cooks. In fact, although I love eating wonderful food and I have a whole bookshelf of cookery books. I CAN’T COOK! Well, I can boil an egg. Ha! Ha! I can also make a mean shepherds pie and at a push, yorkshire pudding. And to be honest, my friends put their lives in my hands when they come to dine on a meal made by my own fair hands. I used to live in London. Nobody cooks. We all went out and drank a bit. Oh, alright then. A lot! So as you can imagine, when I got the chance to actually learn how to make something. 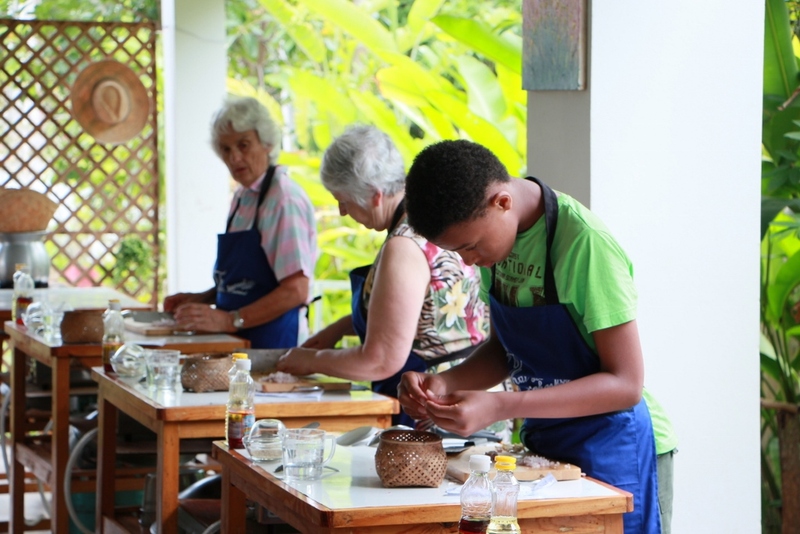 So a few days after we arrived in Chiang Mai, we decided to choose a cookery school with a difference. A cookery school that would give us a deeper insight of what it means to cook authentic Thai food and learn the ways of Thai living. 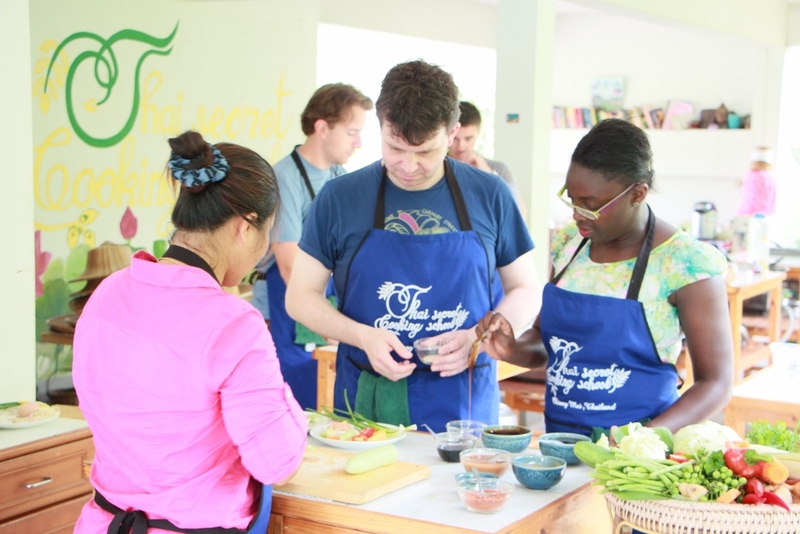 As I said above, we went with a school called the Thai Secret Cooking School and we chose a full day cooking class. Getting out of the songtaew for the very first time! After making all the arrangements online, they picked us up in a red songtaew owned by May and her American husband. A songtaew is a type of red pickup truck with a canopy and twin rows of bench seating. Although tuk-tuks can be found all over Chiang Mai, the songtaew is used as a type of bus and taxi service rolled into one. We were a small group of seven. Two (2) Australian retired ladies, two (2) British medical undergraduates, and ourselves a group of three (3). We then met May’s American husband, and May herself – a tiny, smiling, jolly woman! At the local market in Chiang Mai. 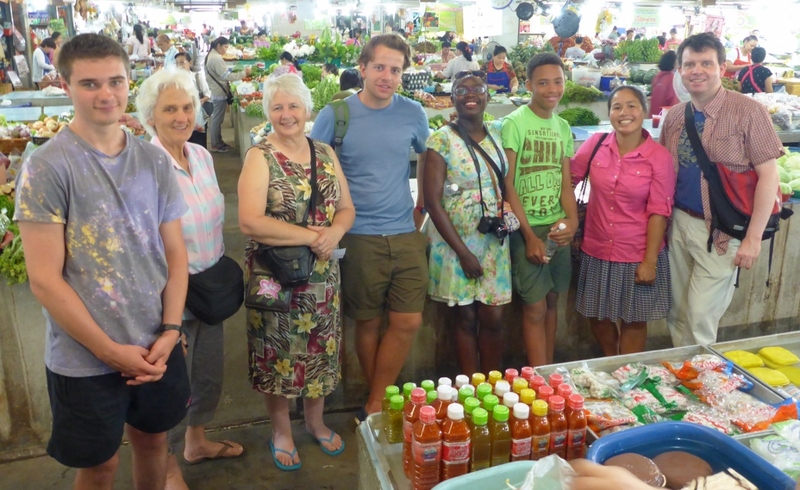 We started off by going to the local market and learning about the different types of Thai rice, local fruit and vegetables. It was really interesting ‘cos we also saw some stuff that I had never ever seen before, and isn’t that the very reason that we travel. 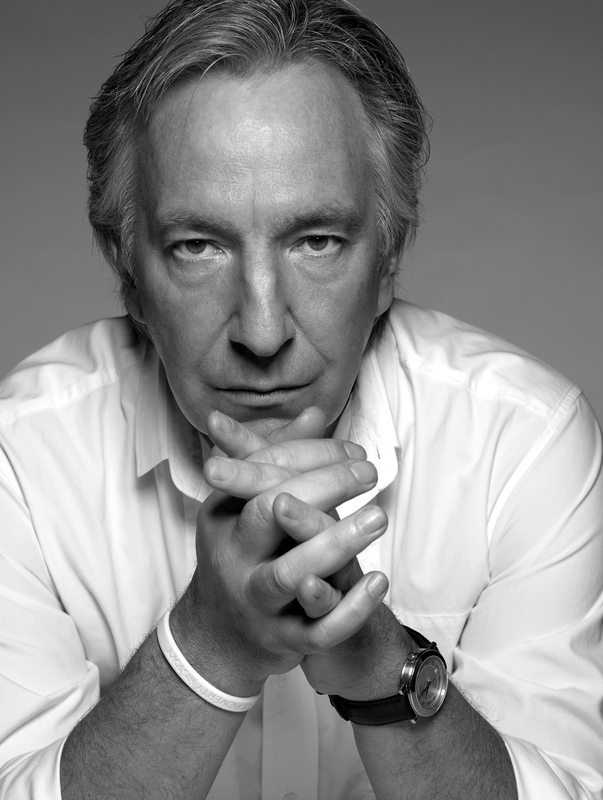 To see things unseen and perhaps also see things that we never ever want to see again. For example the unfortunate woman in Los Angeles who was so desperate for the loo that she pulled up her dress and had a poo. Right in the middle of the street! 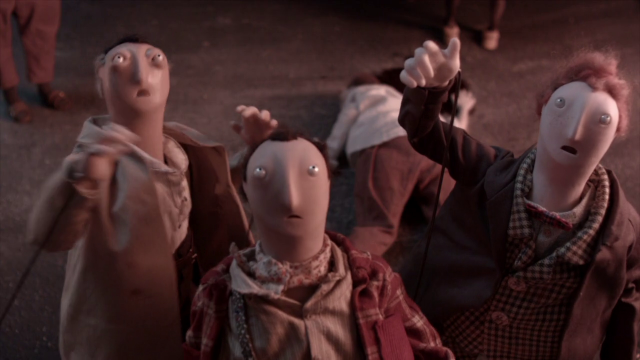 We were traumatized, and “The Tall Young Gentleman” was enormously upset. We still can’t talk about it. And this was across the street from our very famous 5-star luxury Millennium Biltmore Hotel. You know, the one that has been the premier choice for celebrities, presidents and dignitaries for more than 90 years. We saw a wide variety of mushrooms. Different blends of tofu, both squishy and flat. A variety of cucumbers and gherkins, tiny speckled eggs in plastic bags, white eggs, brown eggs, and pink eggs! Prickly fruit, green and yellow bananas, surrounded by freshly cut flowers. Soups and sauces, grilled fish, fresh fish, fried chicken, hot chilli peppers, raw vegetables, Asian cabbages, dripping roast duck hung by their necks, and whole chunks of raw, pink pork including the head, the hooves, the intestines, lungs, stomach and various other internal organs. Basically, all the stuff that usually goes into a sausage, and which we don’t really want to see! After spending the morning at the local market, we went to May’s personal home. Learning how to cook in May’s home and kitchen. The Thai Secret Cooking School is located in PhaPhi Village which is about 20 minutes from the main centre of Chiang Mai and took probably about 30-40 minutes to get there from the marketplace. May has a lovely house with a long table for us to have our meals and individual cooking stations, stoves, pots and pans. 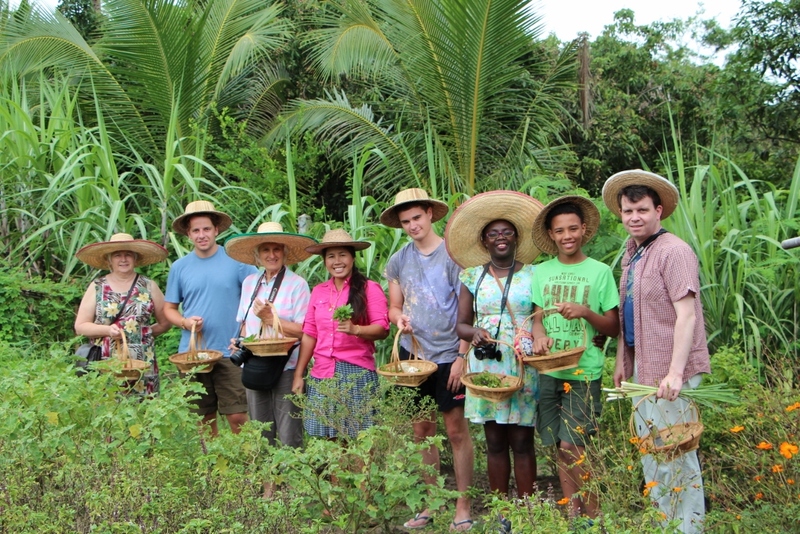 Her home is surrounded by her organic farm and garden, and huge jackfruit and banana plantations. Proud parents recording every moment of our child! 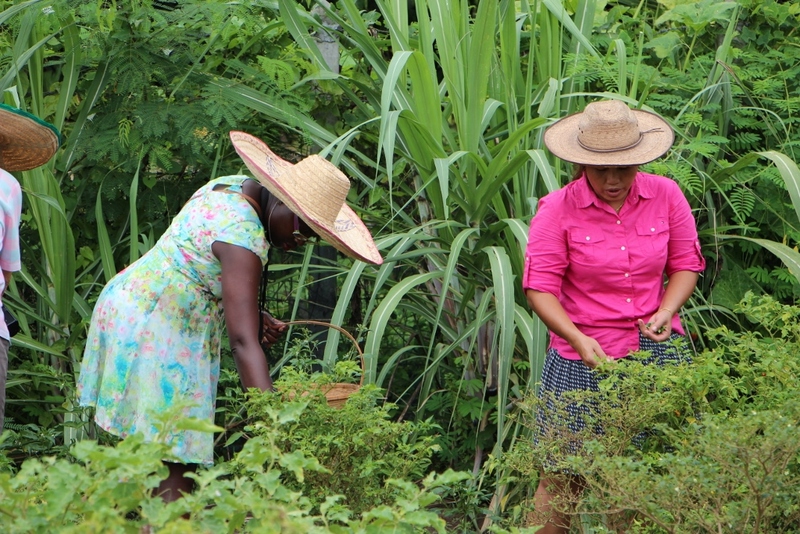 May was really friendly and relaxed and made it clear that we shouldn’t be afraid of living things like the spiders and ants that we saw crawling on branches and leaves, as she had the young men climbing trees and bringing down the fruit. 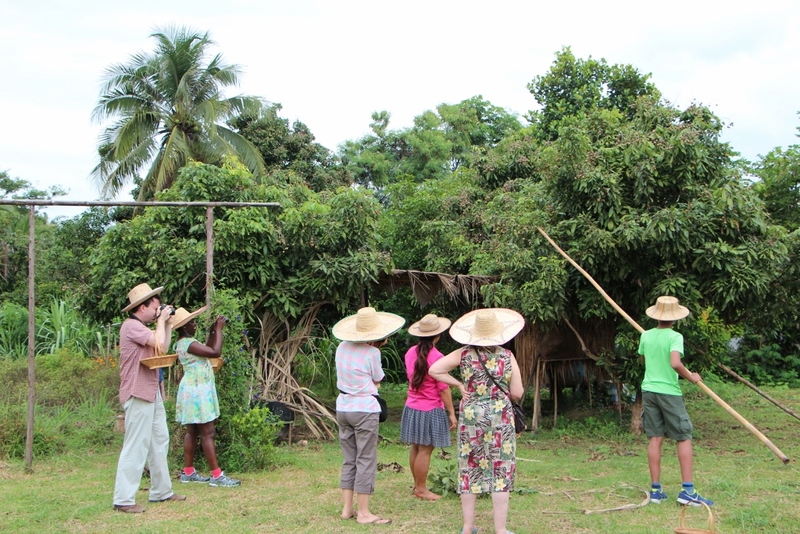 In fact, at one point “The Tall Young Gentleman” was encouraged to use a long bamboo pole to knock down some fruit that we would later use in our cookery class! We’ve donned our hats and now we have to pick stuff in the garden! 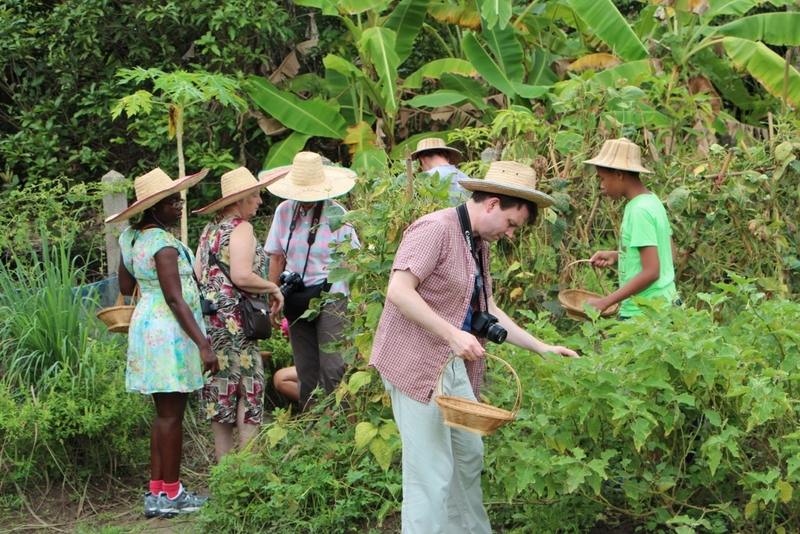 But before that, we had some refreshments and then we donned straw hats and raffia baskets and ventured into the herb and vegetable garden where we were taught how to identify and pick certain pickles, herbs, and spices. And then it was time to get things into action. We had booked a full day course. WHAT IS A FULL DAY COOKING CLASS? Glass Noodle Salad or Yum Woon Sen.
Stir – Fried Sweet & Sour Chicken with Vegetable or Pad Prew. 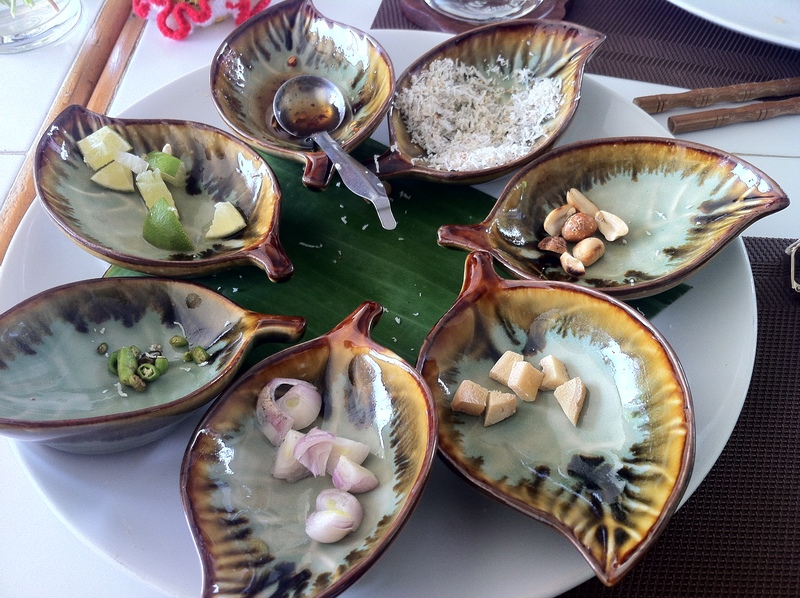 All you need: Basic Thai ingredients such as lemongrass, jack fruit, peanuts, bean sprouts, limes, and chillis. 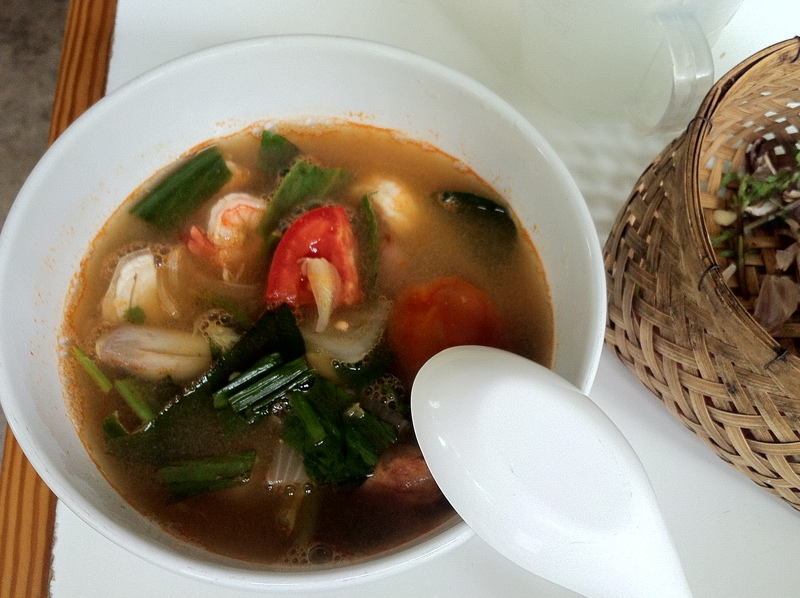 Hot & Sour Seafood in Coconut Milk Soup or Tom Yum Taley. Banana Roll with Honey / Sweetened Condensed Milk or Po pea gluey. Seriously concentrating so that we can follow instructions as quickly as possible. 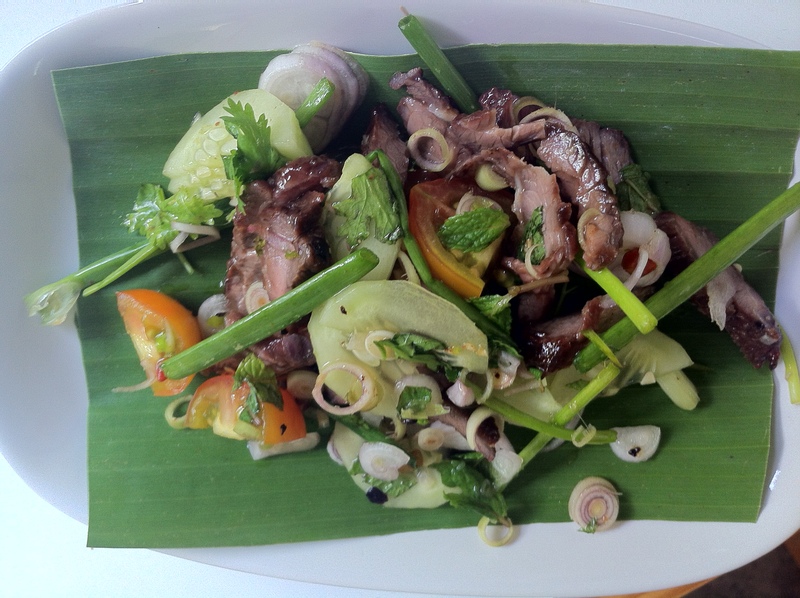 My home-made beef salad covered with spring onions, lemon grass and mint! That’s my beef salad. Quite tangy and deceptively spicy! My home-made Stir-Fried Sweet & Sour Chicken with Vegetables in a wok. 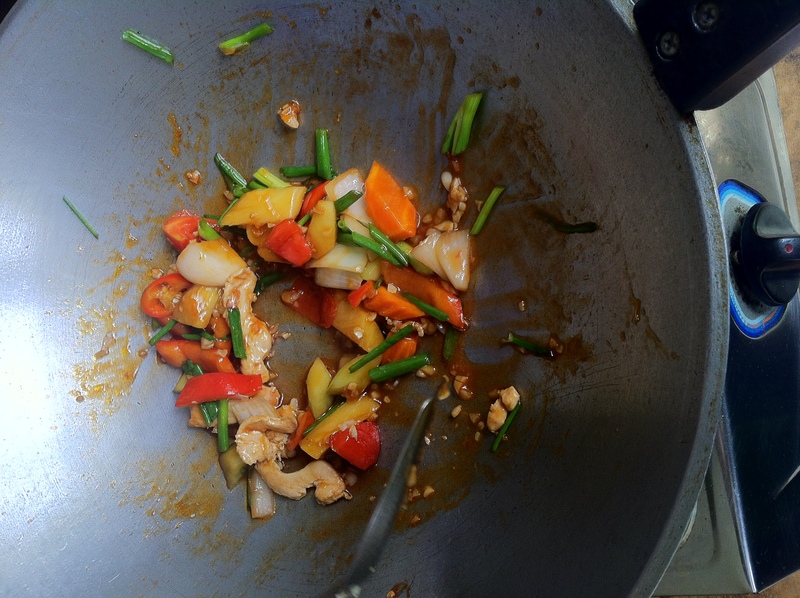 That’s my Stir-Fried Sweet & Sour Chicken with Vegetables in my wok! My home-made Hot & Sour Prawn Soup. That’s my home-made Hot & Sour Prawn Soup. I got into trouble here as it was really spicy and I was coughing and spluttering all over the place, and my eyeballs almost fell out, and so I reached out for my glass of water! If you’re an expert at eating spicy food, you’ll know that in this case, water doesn’t quench the fire, it enhances it, and my tongue was definitely on fire! My home-made Red Curry with Chicken / Pork. That’s my home-made Red Curry with Chicken / Pork. Just by looking at it. you can see that although very delicious, I struggled to slurp it down. I don’t usually eat spicy stuff as I don’t like the heat! In Thailand however, I made an attempt to go authentic because when we first arrived, I asked for “just a little spice,” and they took all the character and personality of the meal away! As such, I decided that whilst we were in Asia, I would go “local” as much as I could manage, which led to me chewing away at a plateful of cucumber as they seemed to cool down my tongue, in more ways than one LOL! My home-made Deep Fried Banana. That’s my home-made Deep Fried Banana although, I was supposed to have made Sweet Sticky Rice with Mango! The Sticky Rice is made with Coconut Cream. I don’t like fruit and savoury mixed up together. Thai ingredients full of Oomph! 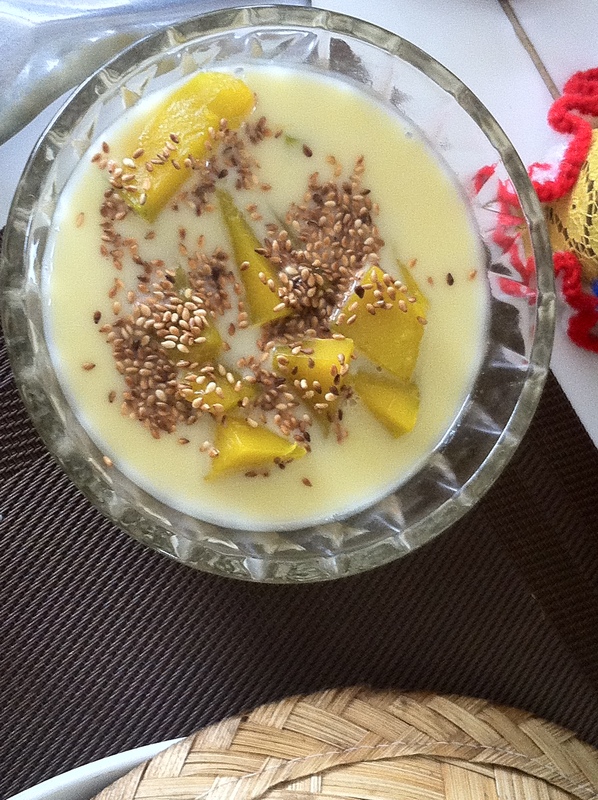 Happily, May worked her magic so that I could still have a dessert dish without the milk and without soft bananas. 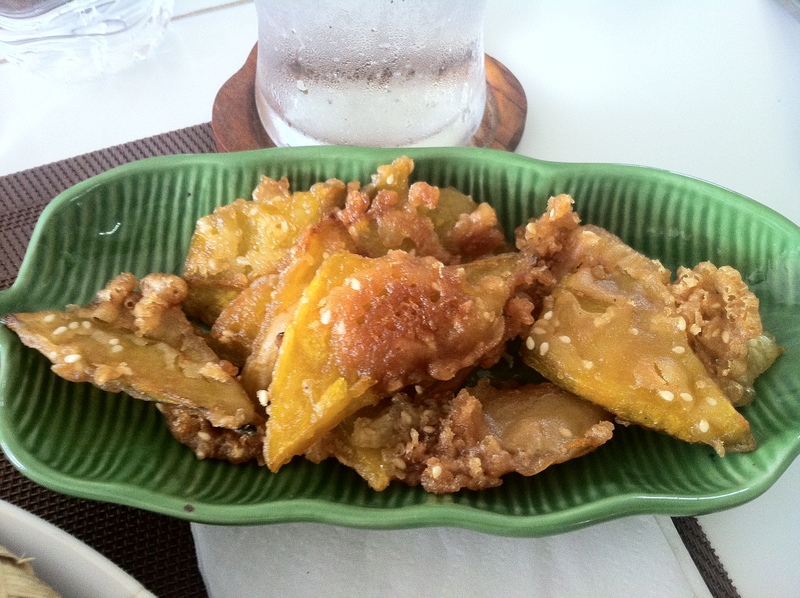 In fact, the Deep-Fried Banana were quite crisp and didn’t taste like a dessert at all but rather like a packet of crisps or potato chips covered with sesame seeds! 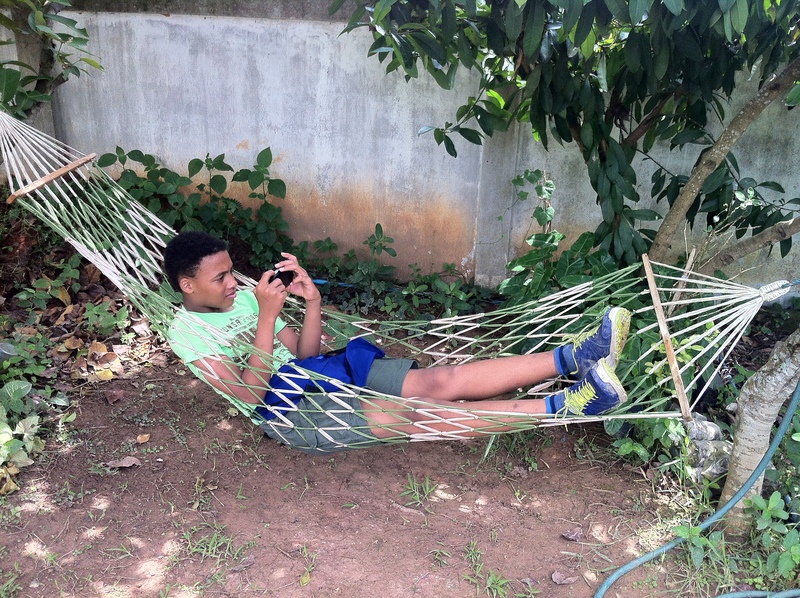 Relaxing in the sunshine in a hammock. It really was a lovely day for cooking as the sun was shining and we even had enough time to take a nap in the hammock in the garden, read a little, and even play with the cats and very shy kittens! Indeed, our small group gelled so well that the retired ladies who had previously booked only half-a day, decided to stay for the full course, and we all shared our food with each other especially when we were so stuffed that we couldn’t eat any more or just to have a peek at the smell and flavour of other dishes. “The Tall Young Gentleman” doing a marvellous job at cooking. Having said that, I think that “The Tall Young Gentleman” did a marvellous job at making six full courses all by himself. I think he’ll be able to cook in the future LOL! Perhaps, even better than myself, and I’m proud of that fact LOL! “The Music Producer” and I learning how to use Thai ingredients and measures! 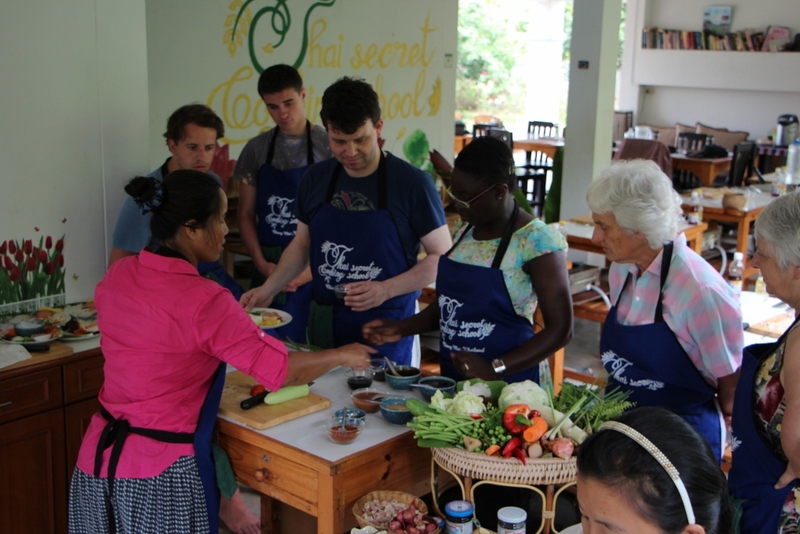 WHAT IS THE THAI SECRET COOKING SCHOOL? The Thai Secret Cooking School is a modern kitchen that upholds the Thai tradition of an open air kitchen with panoramic views of nature that surrounds the local people. WHAT IS THE THAI SECRET COOKING SCHOOL ABOUT? 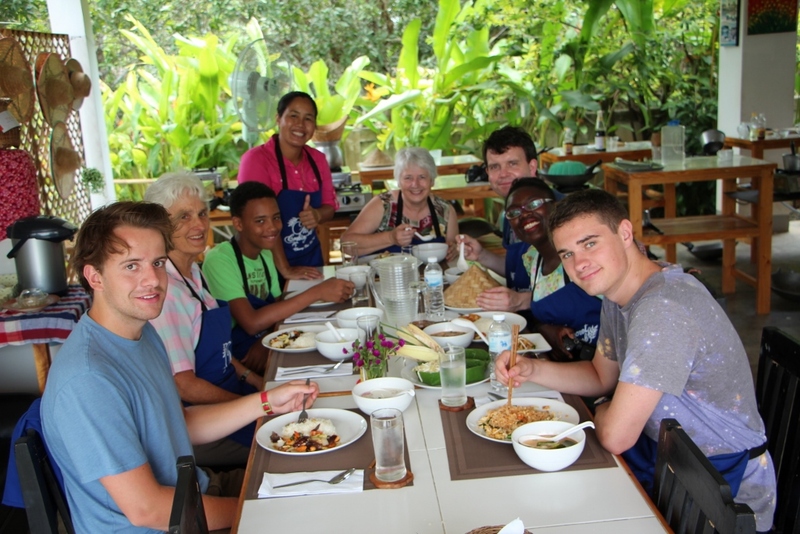 The Thai Secret Cooking School is about an alternative way of seeing the city of Chiang Mai by moving away from the ordinary tourist trail and exploring the cultural, traditional way of cooking Thai food, in a safe, friendly, relaxing environment. 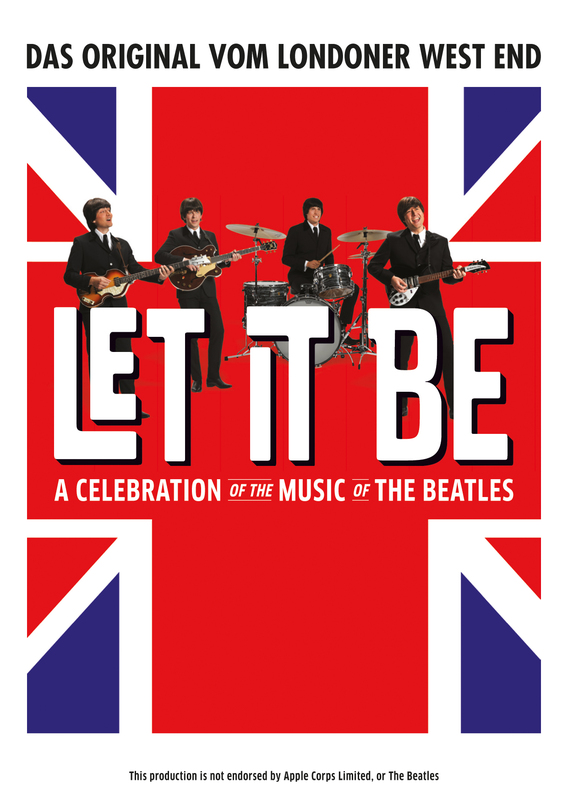 These tour are in English. 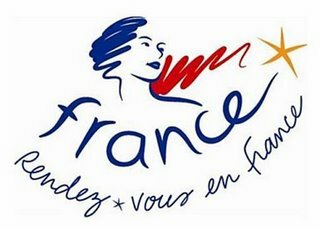 If English isn’t your native-language not to worry, as most of the course is dedicated to tasting, cooking, and enjoying the food that you or your group have made. There will be no time to worry, and May has an excellent sense of humour LOL! Gosh! My boy is really cooking! A pair of good shoes or flip-flops, a pair of sunglasses, possibly a hat, and a huge smile! Yes. This tour cost 1,100 Baht or $34.00 for a full day course, 900 Baht or $30.00 for the evening course, and 800 Baht or $25.00 for the half day course; and was well worth the price. At the end of the course, you are given a “Certificate of Completion” and a copy of their “Thai Secret Cook Book”. As a last note, the Thai Secret Cooking School really does take its food seriously so I would recommend having no more than a few slices of toast and a cup of tea for breakfast, as you will be stuffed! I thought it was brilliant. The classes were relaxed and the food choices were numerous, whether you were a vegetarian, glucose intolerant, or had food allergies like me. Everyone should do a cookery course every now and then, if only to make sure that when guests come to visit, you can impress them or at least, not poison them LOL! Thai food is highly recommended! WHAT IF A COOKERY COURSE ISN’T MY CUP OF TEA? Tickets for the Thai Cooking Class are from 800 Baht to 1,100 Baht. Approximate time: 8 hours for a full day class, 5 hours for a half day class. 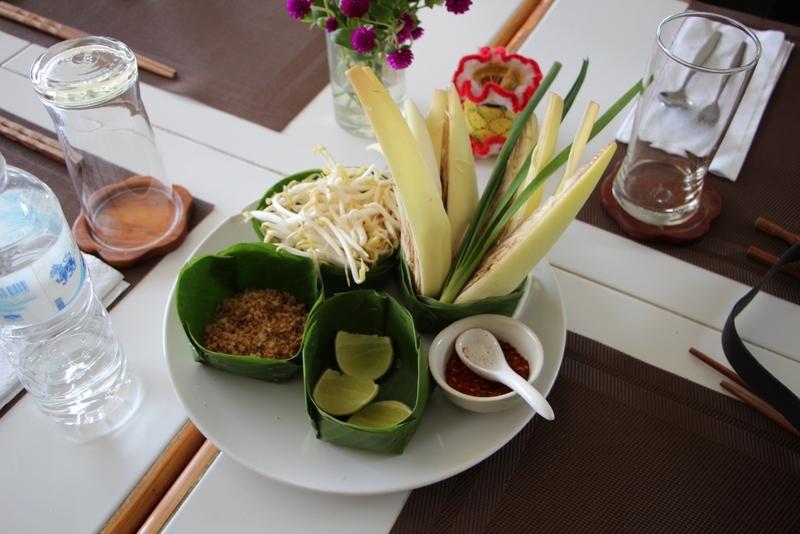 For more information about traditional cooking classes please contact: Thai Secret Cooking School. Happily noshing around the dining table at the Thai Secret Cooking School in Chiang Mai! This article is not sponsored and even though I received a discount, all opinions and the rather wonderful dishes I happily stuffed down, are my very own! I have so much to share with you so for the month of September only, I will be writing about our adventures in Thailand, Indonesia, and Qatar and at the same time, keeping you posted as to the fantastic things going on in my wonderful city of Berlin. Myself with a lovely dish of Red Curry with Chicken / Pork made by Moi! 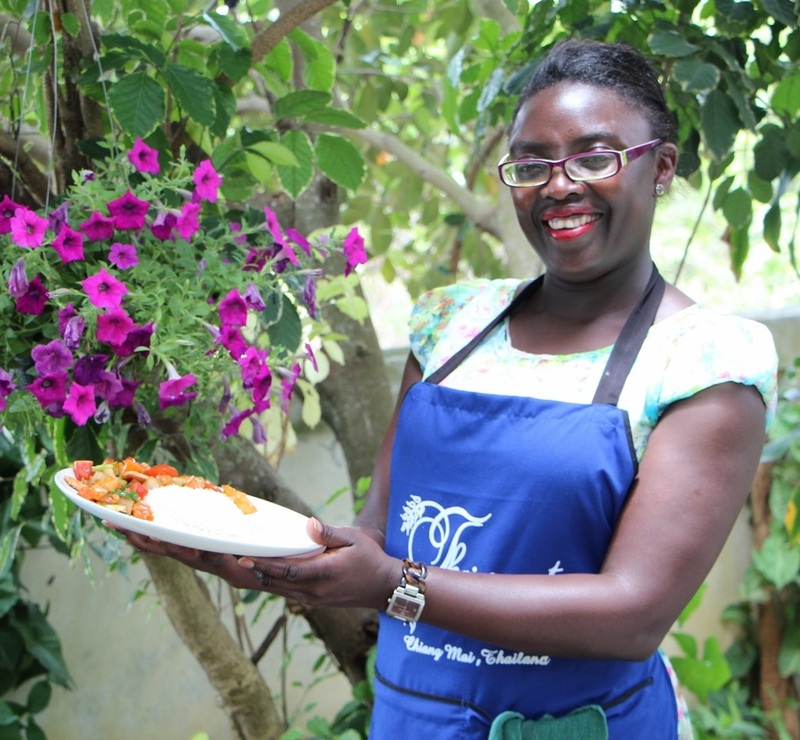 Have you been to a cookery class? What’s your favourite Thai dish to make at home? Previous PostThai food is going to kill you: Eat it or die!Next PostWe Need To Talk About The Elephants! : A Mahout Training Course at The Baanchang Elephant Park. Looks really delicious! Well done! Thanks very much @africanagirl. It really was! I know what you mean Phil! When I lived in London, I didn’t cook either LOL! However, one day it has to happen and Chiang Mai is one of the best places to do so. Now where did I put my wok and lemon grass cuttings?! So..shall we call you Chef BritishBerliner from now on? 🙂 . Your food choices look yummy! I love the hats you guys were wearing..so cute. I like eating food, but making it???? Nope..nope..and nope..would ruin the mystery (aka then l would have to cook, no more excuses 😦 ). LOL! Nah, just call me: a better cook where you won’t necessarily die. This time! 🙂 🙂 🙂 We all got to make our own choices kemkem, which was a lot of fun and pick our own hat for that very authentic feel. All I needed was a donkey to carry my goods to safe pasture!! Lol! Oh..you’ll get it all. Only he cooks it!!! 🙂 . Thank God he loves it, otherwise we would starve to death! I wash up!!!! I hear you my dear. I hear you! AMEN, sister! Boiling water IS cooking! As a New Yorker that was pretty much always my response to the cooking question as well. That said, your experience sounds SOOOOO much fun, and it looks like you aced it! I don’t know how much I would have enjoyed the prep work and the cooking itself, but rummaging around the garden picking things? Totally up my alley. Also I would try everything here – looks much safer than the market/street-food options. You’ve got that right girlfriend! New Yorkers and Londoners rule as the place NOT to cook, but to go out. As a matter of fact, I think Thai people do too. The amount of local people sitting in local food malls, kiosks, and street kitchens, was amazing. Everyone was buying their dinner! 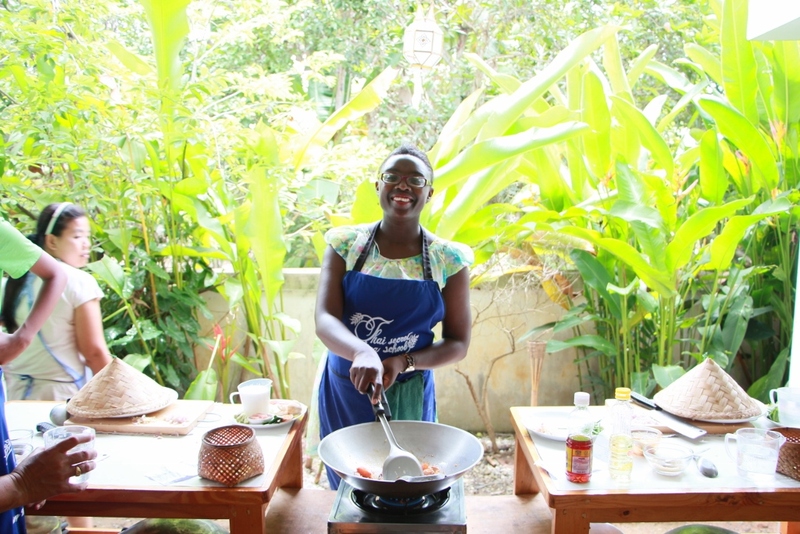 Anna, going to a cookery school was soooo much fun and equally, soooo much work. Thank goodness, I was on holiday. Most of us took a little nap too. What with all the food and the hard work laying it on the table and eating it LOL! It was much safer than street food no doubt about it. My husband was in heaven as German people tend to be meticulous about food efficiency and hygeiene organisation. There were sinks with running water, soap, and individual clean towels to wipe your hands. 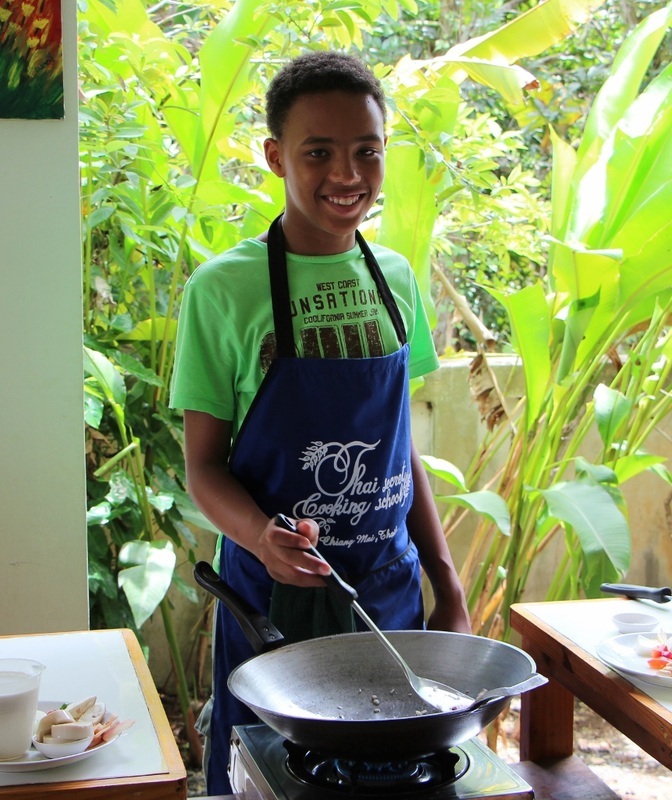 The cooking school was very clean and every ingredient was safe to eat and drink. Even for children. Well, let me tell you. We. Didn’t. Do. That! P.S. The cocktails in Thailand are so lovely, and very, very, cheap! 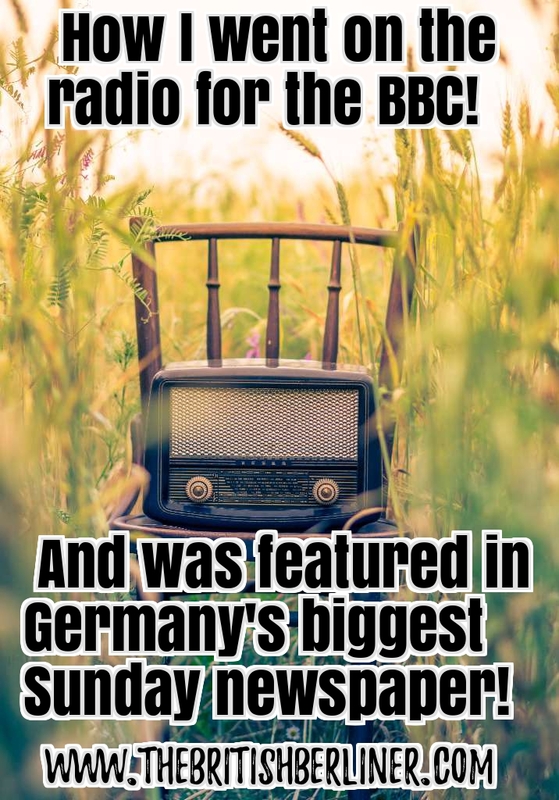 Hehe, i recently found your blog , just like what i visit – http://empruntcommunautairemontreal.com/2014/07/02/top-five-tourist-attractions-for-history-lovers-in-berlin/ in one of your posts. Hey can you as well tell me what was your price for the budget airlines you was using to go there ? Sure John. Using Nok Air, we paid just $34.00. One way. Including all the fees. It was a crazy price, so we booked it! You took Thai cooking classes, how awesome! I did the same thing in Jakarta, but never in Thailand. You are now a real housewife! Thanks my dear! You can cook Indonesian food? Yipee! 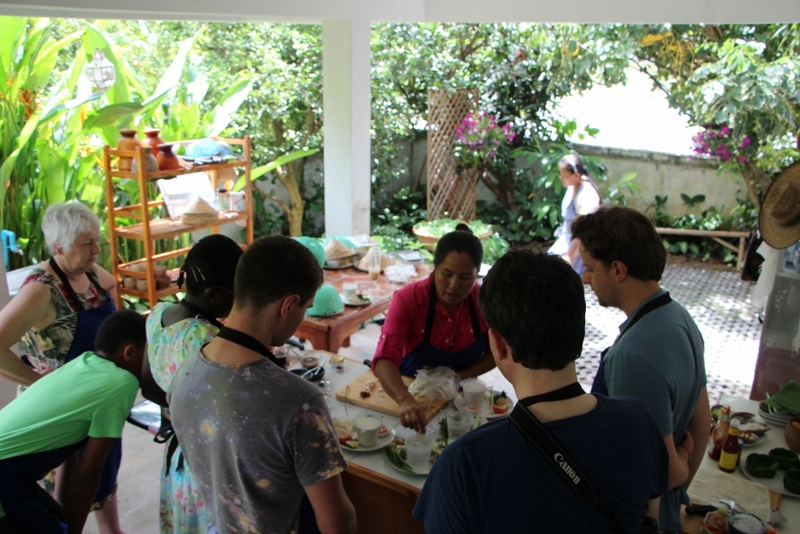 The Thai cooking classes were so fab but me being a “real housewife” is probably pushing it. I’m far too glam LOL! Wow! Looks way better than the thai cooking class I took. You really got to pick veggies? Awesome! Where did you have your cookery class? These are gorgeous, and I wish I were crafty enough to make those banana leaf plates! I’d probably go to this cooking school with someone that doesn’t eat anything, and eat their choices as well. Looks incredible! Thanks Jenna! I wish I could make those banana plates too. They’re delightful, and so was the food! Incredible is so, a tip of the iceberg LOL! I went to this same school! May is so much fun!! I learned a lot (and ate a lot) haha. It’s too bad you’re allergic to coconut, mango sticky rice is my favorite meal in Thailand!! Friend bananas are still pretty great too. 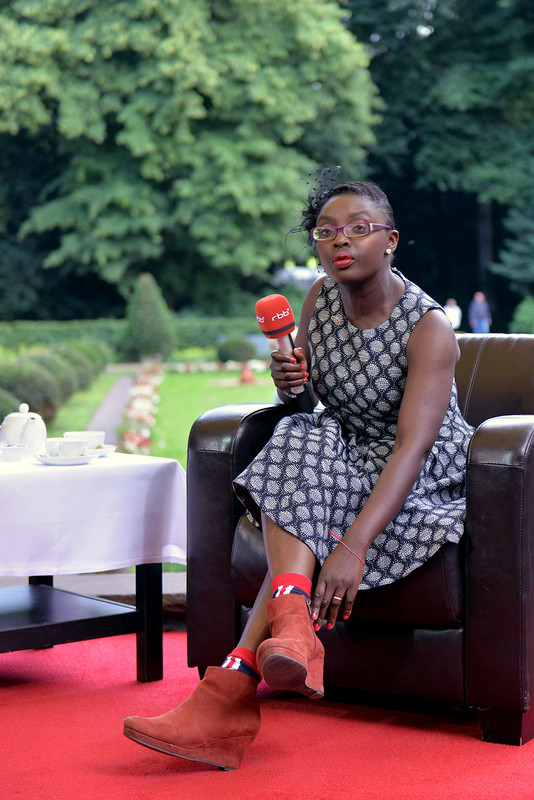 I loved the atmosphere there! I know Katie!!!! May is a delight! My allergies are a killer but I make do. There were lots of other things to have and she showed me what they were. It was a shame that I couldn’t really have the soups, or the mango sticky rice, or the milky cocktails! But if I found something that I liked, I pretty much kept having it, and it hasn’t stopped me from having a good time one bit LOL! that’s a very unusual post about Chiang Mai, i was starting to think that the city was only a gathering point for travel bloggers lol. From the pictures it looks like you’ve done very well with your cooking, especially for someone who claims she can’t cook at all. Well done, i’m sure it must have tasted delicious. I run an expat blog too, would you like to share your story about your life in Berlin? 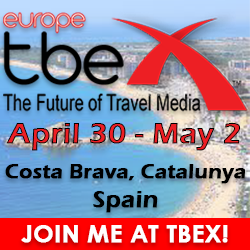 or your other travels? Let me know i’d love to feature you on Diary of a Serial Expat. Thank you Jameela! Chiang Mai is actually more diverse than you think even though many expats from the Northern Hemisphere tend to go there as it’s cheap, and easy to live in. However, I noticed a lot of Asian tourists from China, India and Singapore there too. In fact, a lot of the restaurants had menus in Chinese. It actually pleased me to know that Thailand is attractive to others as well as Europeans, as we tend to think that these places are just playgrounds for us. Thanks for the lovely comments about my cooking but honestly, I really can’t cook! Just ask my husband. and for that matter, ask my son. I can cook English food of course, but that’s pretty much it! Thanks Cristin! It was truely awesome! It was nice and crispy and not too sweet and for once, I could eat it, as I don’t normally have bananas. I don’t like them LOL!